First class PLA with a high percentage of natural Wood, it does not incorporate recycle material or recuperated. Excellent printing resolution. Due to the high amount of wood particles seals may occur on 0.4mm diameter that is why we recommend nozzles with diameter 0.6 or higher. We recommend to feed the printer without making pronounced turns on Bowden systems this way you will avoid breaking the filament. We recommend to print with a layer higher than 0.2 mm. It is important to avoid the filament to heat with the extruder in standby this can produce blocks. The finish surface can be changed by increasing the printing temperature. 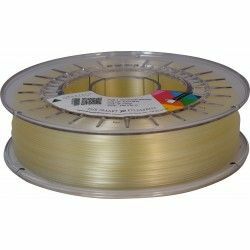 What can you achieve with this filament? ...es posible! 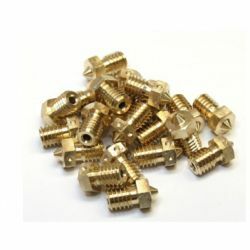 He impreso bastantes piezas con este material y un nozzle de 0.4mm consiguiendo muy buenos resultados. Como por ejemplo en esta pieza: https://www.etsy.com/es/listing/598341948/pendiente-dilatador-tribal-earring.